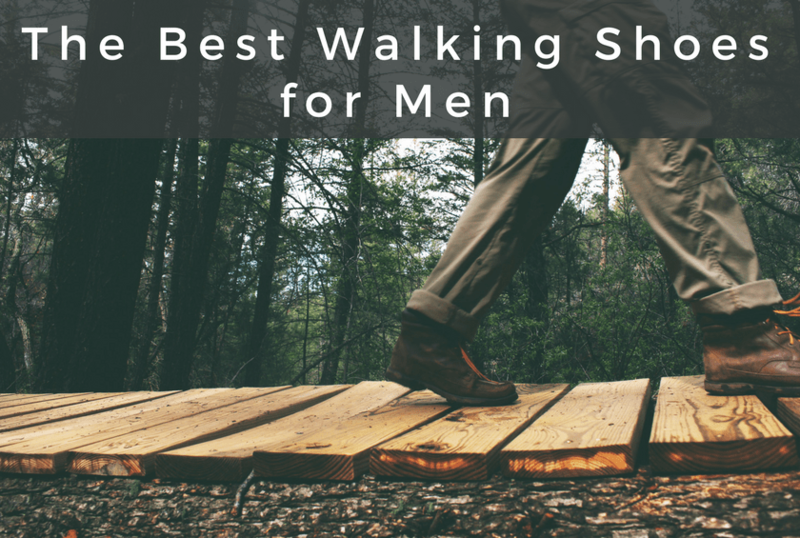 The best walking shoes for men provide plenty of support in a comfortable style that doesn’t bind or pinch. Because whether you’re walking around the block or participating in a parade, you shouldn’t have to worry about blisters or hot spots. Good walking shoes should provide plenty of cushioning and support. They are designed to protect your feet across a variety of surfaces from pavement to dirt to the treadmill. Many of the shoes we reviewed will work great as a pair you can wear around the office so that they can do double duty. You’ll find some good-looking options among our picks. And if you are looking for a women’s pair of walking shoes for your significant other, check out this article. Let’s run down our list of favorites and the features that make them worth considering. Despite its odd look and expensive price tag, the MBT Simba 17 might be one of the most comfortable walking shoes you’ll ever own! Designed to imitate walking barefoot on soft, muddy ground, the Simba 17 has a soft, cushioned feel that helps to alleviate back pain and other walking-related issues. The shoe achieves this with its curved sole that rocks gently as you walk. The Simba 17 has more of a traditional walking shoe look than other MBT shoes. It has a breathable upper and durable sole, ensuring that you’ll get your money’s worth from these costly shoes. But if you can get over the funky look, these popular shoes will be extremely comfortable on your everyday walks. 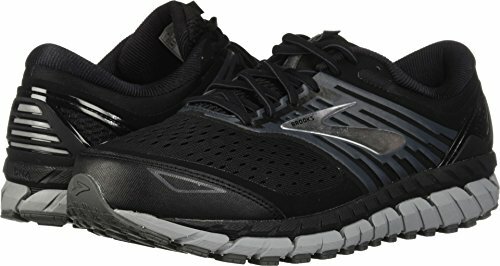 The Brooks Addiction Walker is a supportive, cushioned shoe made by Brooks – a company that focuses solely on running and walking shoes. It’s often recommended by orthopedists and podiatrists for individuals with foot problems and leg pain. The shoe is an excellent value due to its durability and sturdiness. It’s a product that will last for the long haul. It’s lighter than many walking shoes, which is always an advantage when you’re getting a shoe for everyday use. The design is sleek and classic with a low top that we liked. It’s a stylish pair of shoes that will look good with anything. We loved the leather uppers that gave it a quality feel. The arch support is top notch, though we would consider swapping out the insole to ramp up the comfort level. The shoes provide plenty of stability for all-day wear. 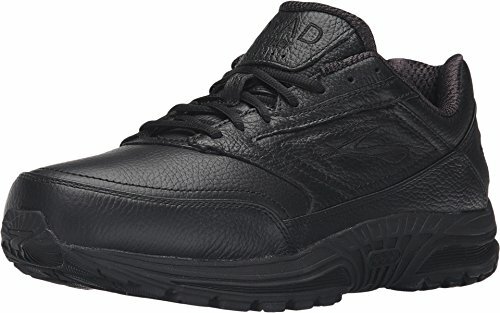 Overall, it’s a good buy while a bit more expensive than some of the other best walking shoes for men. 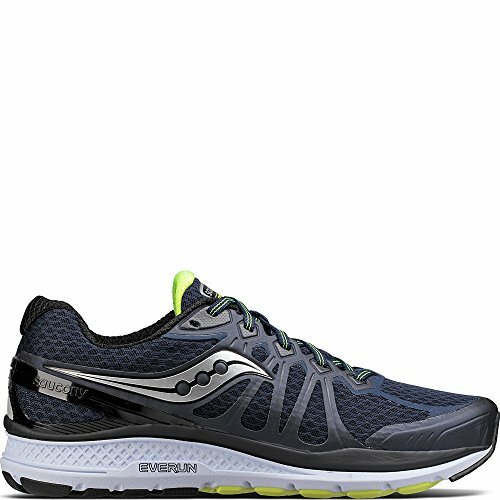 The Saucony Echelon 6 is definitely worth considering, especially if you wear orthotics, which fit great in the shoes. They offer a lot of support and some welcome cushioning all through the design. They are quite flexible and can handle some rough terrain. The shoes are lightweight which makes them a good option for long walks. The toe box was roomy for splaying your toes – in fact, the overall shoe has a wide feel. The quality certainly is here with a product that is both sturdy and durable. The construction is great. It’s a top brand, and it shows. The mesh, breathable version of the Echelon only comes one color; however, look for the Echelon LE2 version if you want an all black or white leather walking shoe. The New Balance 1865v1 is a slick looking shoe that features a fabric upper and a rubber sole. It’s a well-made design that uses quality materials. The lacing is adjustable which is great for honing in on a good fit. It offers decent arch support, too. With all of that going for it, it’s a shame that the shoe runs smaller than expected. That said, it is a sturdy pair of shoes that will absorb plenty of road shock. With the right fit, it’s a comfortable pair for fitness walking. The durability makes them a good choice for an everyday shoe. The sole with its rapid rebound will literally add a spring to your step. It has a sleek profile with a low back collar. They look great despite the branding on the sides. 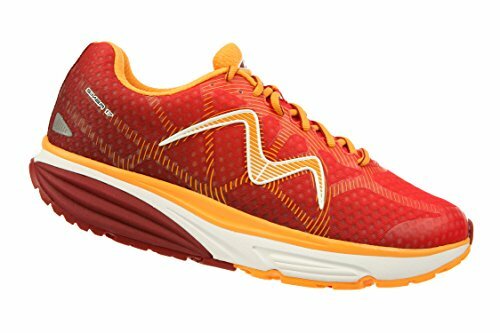 The Hoka One One Bondi 5 LTR is a maximalist shoe with lots of padding and cushioning for a comfortable ride. That’s where this product succeeds. The support is outstanding with plenty of wiggle room in the toe box which we loved. If you want a walking shoe with lots of cushioning, it’s worth a look. The shoes are lightweight and breathe well for optimal airflow. The traction is excellent whether you’re walking the neighborhood or doing a hard power walk. You might even consider wearing them on the trail. The overall design is outstanding except the tongue which caused some irritation. On the downside, the shoes aren’t cheap. However, you do get what you pay for in a durable product that will last that 300 to 500 miles before you move on to the next pair. It’s a good choice if you want to add running to your fitness routine. The Brooks Dyad Walker is another good looking offering from Brooks. This one features a leather upper and a matching colored rubber sole. It features neutral support that is appropriate for those with medium-high to high arches. 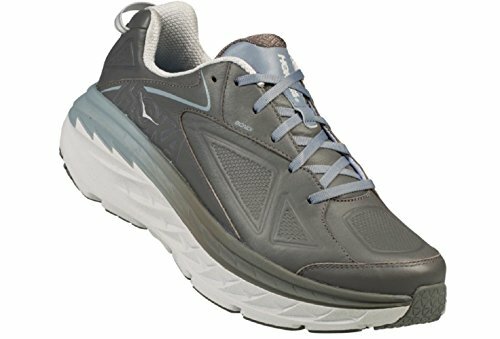 The design is spot-on with plenty of cushioning throughout the shoe with a well-made insole that gives it the stability we long for in the best walking shoes for men. The shoe also fits an orthotic very well, if you have that need. Walking feels great with this pair. They’re durable and can stand some punishment. The padding on the collar is comfy. We liked the sweat-absorbent lining too. The only drawback is price. 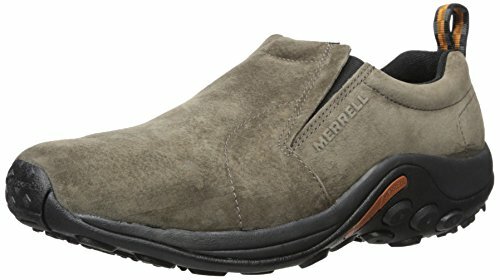 The Merrell Jungle Moc is the only slip-on shoe we considered. 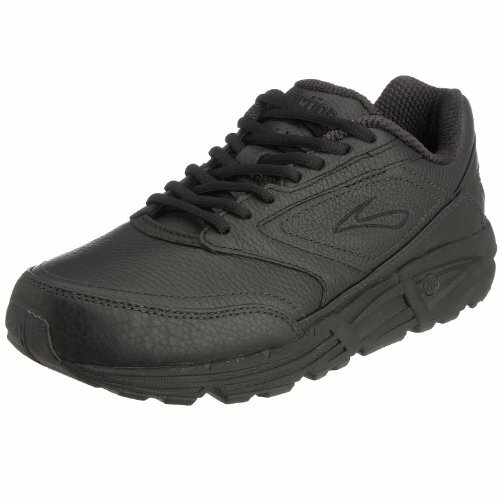 It has a sporty look that you can wear on the path or at work. The upper consists of water-resistant leather. It’ll handle sloppy conditions, but we won’t wear them if it were really messy. The overriding feature is comfort. The shoes, of course, don’t have laces, but the bit of elastic at the top makes taking them on and off easy while giving some extra room. You can remove the insoles if you’d like to swap them for something different if just to extend the life of the shoes. It’s the kind of shoe that you can just put on and take off down the trail. It’s comfortable out of the box. It has reliable arch support for a casual shoe. The mesh lining is breathable for optimal airflow. It definitely qualifies as a pair worth considering if just for something to wear to work. 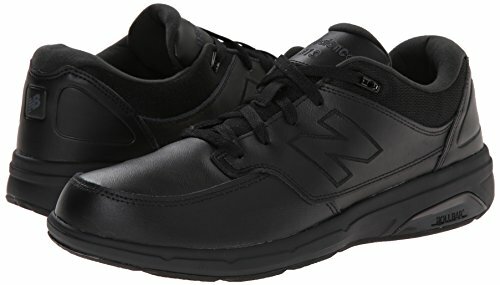 The New Balance 813 is a relatively affordable pair of walking shoes with a low top and handsome profile. It has an upper made of leather with a matching rubber sole. It is fairly lightweight for walking on the trail or an easy run on pavement or crushed limestone. There is plenty of supportive cushioning all through the construction. The collar is soft with padding all around that protects against chafing. There’s plenty of room in the toe box. The fit was what we expected too for the size anyway. The width is a bit narrower. We did notice the occasional quality control issue primarily with the stitching on the upper. The support is adequate but won’t be enough if you have foot issues. We can easily see this pair more like a shoe to wear at work than use on the trail. The Rockport World Tour Classic feels like a well-worn pair of jeans out of the box. These shoes have it all: good looks, comfort and class. The appearance aside, they are an excellent product that provides plenty of stability while maintaining its flexibility. They’re a pleasure to wear because they absorb a lot of the shock when walking on hard surfaces like pavement or concrete. They have an easy-to-clean leather upper and a rubber sole. They come in a wide range of colors primarily on the neutral side of the spectrum. There is ample cushioning throughout the shoe including the ever-important insole. Overall, they are roomy including within the toe box. Though they cost a bit more, they are worth the investment for a durable shoe that will provide miles of comfortable walking. The Brooks Beast 18 is the latest offering in the Beast line. It’s a solid walking and running shoe made by a manufacturer known for quality products. The first thing you notice about it is its look. It’s has a slick, low profile with a tasteful color scheme that’s not over the top as the name may suggest. The latest version offers a seamless upper for a modern, clean look. It’s also softer and offers much more breathability than older versions. They are the shoes you should consider if arch support is an issue. You’ll get more than enough with this pair for your daily run or walk on the trail. The traction is excellent too. Stability is king with them, making them a good choice for users with overpronation. The fit is comfortable with a lot of cushioning all around including the collar. They are expensive which isn’t unexpected. However, the design is top-notch for what you get. It’s a pair of shoes you can wear all day long in comfort.